Video: This Machine Wraps Your Shoes With Plastic! Home / Computers/technology / Gadgets / Video: This Machine Wraps Your Shoes With Plastic! The Quen shoe cover dispensers are a time-saving, hassle-free way to cover the shoes of workers and guests to your business without forcing them to put the shoe covers on manually. 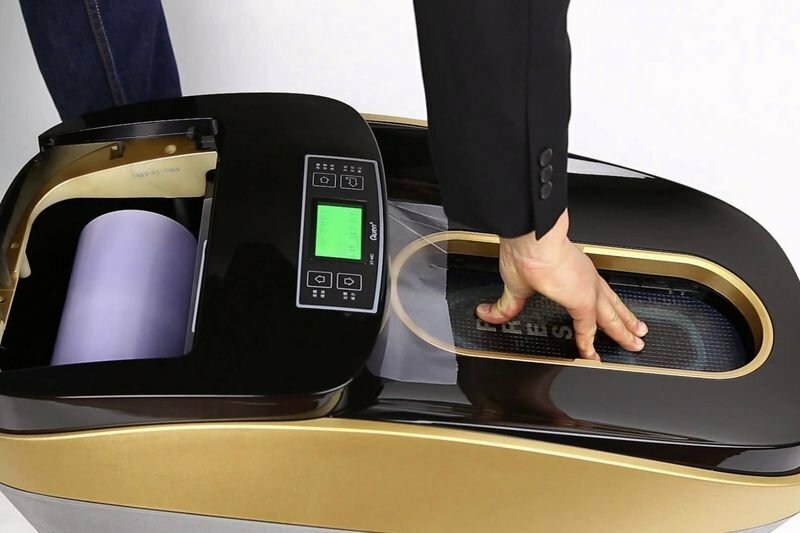 The way it works is that, when you have your shoes on, all you need to do is to step in and out of the automatic shoe cover dispenser and a disposable shoe cover will be automatically mounted to your shoe – hands-free. This Intelligent automatic shoe cover dispenser can solve the problem of changing shoes or applying shoe covers by hand when people enter the clean area. It only takes 3 seconds and it is a safe way for visitors to cover their shoes without a struggle. Have a look at the video below to see how the Quen shoe cover dispensers work.